When you own a ProSource® franchise, it’s imperative that you are an expert on all the products we offer. While many of our franchise owners come from a home improvement background, if you are just getting started in the industry, we want to make sure you have all of the information necessary to help your trade pros find the products their clients need. That’s why we are putting together a series of articles featuring information about each of the products we offer — so you can feel confident that you understand your customers’ needs. 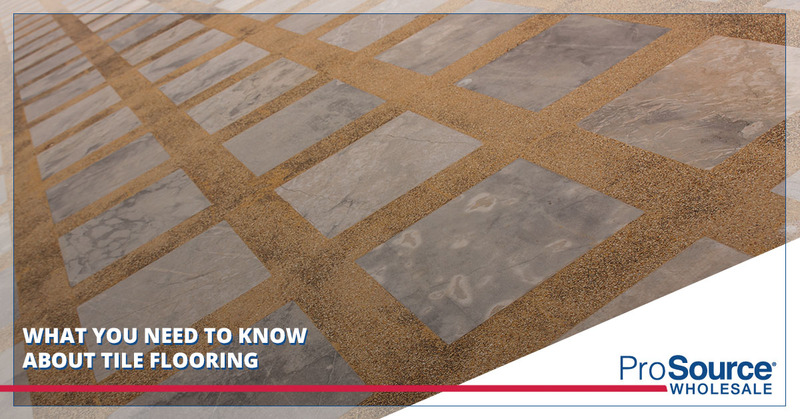 Today, we present Tile Flooring 101. Tile flooring is very environmentally friendly. First of all, tile has been used for hundreds of years for a reason — it lasts. While carpet, vinyl, and laminate flooring all need to be replaced, if tile is installed properly, it will last a lifetime. In addition, tile flooring is beneficial for indoor air quality. One of the concerns with air quality is volatile organic compounds (VOCs), which cause a variety of health problems. Due to the nature of how tiles are made using extremely high temperatures, there are no VOCs in tiles, and therefore, no VOCs that are released into the air. This also means that tile is hypoallergenic. Even the tile manufacturing process is green. Tile factories reuse water and other materials, and don’t send much in the way of scraps to landfills or wastewater to treatment facilities. Finally, tile is low maintenance. All that is really needed to clean ceramic tile is warm water, so there is no need to use harsh chemicals or cleaners. Tile flooring is incredibly durable and can take whatever you throw at it. When you’re looking for a flooring option that will last, none compare to tile. In addition, tile is fade resistant, so you don’t have to worry about installing it in sunny areas, and fire-resistant, so it is non-combustible and won’t give off toxic fumes if exposed to fire. Tile is timeless. It has been used in many of the greatest buildings of our time. This connection to hundreds of years of culture lends a certain elegance to this flooring option. Tile is responsible for some of the most beautiful floors in the world, and has been for centuries. Tile comes in a variety of different styles and colors, so for clients who are looking for a customizable flooring option, tile can’t be beat. There is virtually no limit to the choices of texture, color, shape, and style, especially at a ProSource showroom, where we offer more than 50,000 products. As stated above, tile is perhaps the lowest maintenance flooring option one can choose. All you need to do is wash off dirt or stains with warm water — no additional materials are required. This is part of the reason why it is commonly chosen for outdoor spaces. There are several different types of tile to choose from, depending on the needs of your client. Porcelain: Porcelain tile is highly water-resistant, making it popular in kitchens and bathrooms, and commonly is installed with a slip-resistant finish. Terra Cotta: Terra cotta comes in a earth-tone color. It is generally sealed because it is less stain resistant and needs more protection than porcelain. Glazed: Glazed tile can be either single or double fired. Single fired tile is sturdier. Many clients may choose a gloss finish but this does stand the risk of scratching. Mosaic: Mosaic tile is stain- and moisture-resistant. It is also less likely to chip than other types of tile. Quarry: Quarry tile is usually used outdoors in warm climates where freezing temperatures are unlikely. They are durable against the elements. Tile flooring works best for bathrooms, kitchens, and hallways. This is because they have no problem withstanding the high traffic that’s typical of these areas of the home. In order for tile to last as long as it should, it’s essential that it is installed properly, which is part of the value of what our trade professional members offer. We’re happy to help dissuade their clients from trying to DIY this massive undertaking by offering our wholesale prices. They don’t need to cut corners on paying for installation services, because they are getting the best price on tile possible. As stated above, tile flooring is incredibly easy to maintain, so most homeowners will have no problem doing it themselves. Generally, wiping up spills and sweeping up dirt and debris on an as-needed basis is sufficient to maintain a beautiful tile floor. However, tougher stains will need to be addressed by a professional. Professional tile cleaners use a large steam cleaning machine and special cleaning agents to help restore the appearance of tile flooring. Now that you’re familiar with the basics of tile flooring, you can see why we are happy to offer a wide selection of affordable, quality tile to our trade professional members. If you’re interested in becoming a flooring wholesaler yourself, we are interested in getting to know you. Contact us to learn more about our unique franchising opportunity.